Just another reason to stop bye Valley Cabinets in Montgomery NY!! 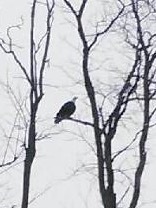 Not only are we amazing custom kitchen and bath cabinetry, but a Bald Eagle hangs out here!!! WOW!! !